Download the toolkit now (PDF). 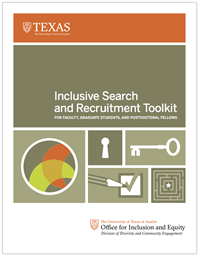 The Inclusive Search and Recruitment Toolkit for Faculty, Graduate Students, and Postdoctoral Fellows is a comprehensive toolkit compiled by the Office for Inclusion and Equity (OIE) in the Division of Diversity and Community Engagement at The University of Texas at Austin (UT Austin). The toolkit provides strategies and ideas drawn from best practices for inclusive searches and recruitment from across UT Austin, comparable institutions with NSF ADVANCE grants, and relevant research literature. Suggestions and practical examples are provided for the distinct stages of the search process including before recruitment begins, planning the search and recruitment process, during recruitment, and evaluating the recruitment process. In addition, references and additional resources used to compile the toolkit are included. In this toolkit, diversity is defined as demonstrating respect for all individuals and valuing each perspective and experience. Diversity includes but is not limited to dimensions of dis/ability, gender, gender identity and expression, international/national origin, race/ethnicity, religion, sexual orientation, socioeconomic status, and veteran status. A more diverse campus community comprised of students, faculty, and staff contributes to a richer and more welcoming teaching, learning, research, and work environment (see for example Chang, Milem, and Antonio, 2010; Hurtado, Alvarez, Guillermo-Wann, Cuellar, and Arellano, 2012; Reddick and Saenz, 2012).